Flat races take place all over France with the main racecourses Longchamp , Chantilly, Deauville, Maisons-Laffitte and Saint-Cloud. 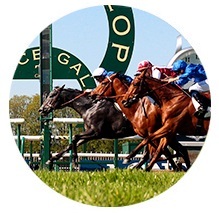 5,000 races are organised in France on 150 racecourses with a total number of 10,200 individual runners. The total prize money reaches around 120 million euros, with an additional owner’s premiums of 45 million euros and breeder’s premiums of 20 million euros.